Length: 6 hrs. 39 min. Dozens of influential leaders have heard the pleas of mothers and children in developing countries. 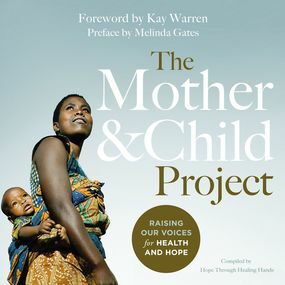 Raising their voices to inspire a movement to increase healthy pregnancies and lower death rates, Melinda Gates, Kay Warren, Bill Frist, Kimberly Williams Paisley, Michael W. Smith and more speak out about why people of faith must get involved in The Mother and Child Project: Raising Our Voices for Health and Hope. Almost 287,000 women die each year because of pregnancy and birth complications. Many orphans are left behind in the wake of this tragedy, and without a mother, many of those children die as well. If only enough people knew. We have the resources to prevent this crisis, but we must take action. Fortunately, Hope Through Healing Hands, a nonprofit organization promoting awareness for healthy mothers and children worldwide, is already spreading the word. Not only can we save lives, reduce abortions, and decrease death rates, but also we can help build healthier, thriving families and bring stability and sustainability to families, communities and nations. The question is, will you join them?